Five Syracuse University faculty and staff members will receive the Chancellor’s Citation for Excellence at a campus ceremony and reception in their honor on Monday, April 1. Marion Wilson, associate professor of art, design and transmedia in the College of Visual and Performing Arts and director of community initiatives in the visual arts in the School of Education. The Chancellor’s Citation awards were first presented in 1979 in recognition of outstanding achievement in teaching, scholarship and creative work. Over time, the focus of the awards has changed to reflect new priorities and institutional directions. The emphasis on excellence and outstanding achievement remains unchanged. Each year, members of the University community are invited to nominate a colleague or co-worker for recognition. A selection committee composed of faculty and staff from across campus reviews the nominations, and award winners are honored each spring. All five honorees will receive a special art object, along with a citation statement recognizing his or her accomplishments. As a professor of practice in the Department of Public Health, Food Studies and Nutrition, Cowart co-founded the Genesis Health Project in 2004. It is a partnership between minority churches, community and government sponsors and the University to reduce health disparities in minority populations. Focused on black families in low-income areas of Syracuse, this community-designed, culturally sensitive initiative promotes healthy lifestyles across the lifespan among African Americans, who have the highest rates of obesity in the U.S., by empowering them to improve their diets, food preparation techniques and exercise habits. In 2012, membership and project scope increased to include 10 inner-city minority churches and an expanded programmatic reach encompassing diabetes prevention and management as well as stroke. Under Cowart’s leadership, the Genesis Project has accomplished numerous milestones, including health seminars, fitness programs, educational programs at barbershops and healthy lifestyle activities with churches and universities. Her work and the Genesis Health Project were recognized with the prestigious National Center on Minority Health and Health Disparities Director’s Award in 2008 from the U.S Department of Health and Human Services’ National Institutes of Health. She received the 2011 Robert F. Allen Symbol of H.O.P.E. 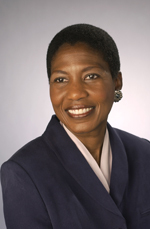 (Helping Other People through Empowerment) Award from the American Journal of Health Promotion for her efforts related to addressing health disparities and received the 2012 Post-Standard Achievement Award for her pioneering work with the Genesis Health Project in the Syracuse community. The Genesis Health Project has also been recognized several times with the SU Chancellor’s Award for Public and Community Service. The Barbershop Education Program is one of the health promotion and outreach activities sponsored through the Genesis Project. The program has gained national attention and funding with its efforts to reduce the prostate cancer death rate among African American males, which is double the rate of white males. Instead of doctor’s offices—which many men avoid—Cowart reaches out through barbershops. Educators emphasize the importance of testing and diet and exercise and offer referrals for testing. Barbershops also hand out educational materials and continue the conversation. Students enrolled in Cowart’s “Culturally Competent Healthcare” class complete an experiential learning practicum in support of the project that often ties into Genesis Health Project initiatives. “The experiential learning component provided an opportunity for students to engage individuals and families from various cultures and utilize new culturally competent strategies in promoting health in a non-traditional setting,” says Bruce Kingma, associate provost for entrepreneurship and innovation, who nominated Cowart for the award. The project not only benefits the communities served, but gives students—future healthcare leaders, policymakers and practitioners—practical experience in addressing major public health issues that affect poor and underserved populations. Cowart has been a Robert Wood Johnson Executive Nursing Fellow. She holds a bachelor’s degree in nursing from Wayne State University and a master’s degree in nursing education, a master’s degree in rehabilitation and vocational counseling and a doctorate in adult education and administration, all from SU. 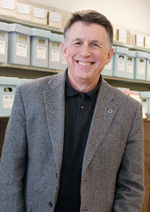 When Galvin joined Syracuse University as the director of Archives and Records Management in 1995, the Pan Am 103/Lockerbie Air Disaster Archives collection had already been established. It already included Syracuse University materials on the 1988 tragedy and memorabilia and some personal effects relating to the 35 SU students who perished aboard the doomed flight. But the collection became a labor of love for Galvin. He expanded its scope to include all 270 victims, not just those associated with SU. His efforts have resulted in many of the victims’ families “adopting” SU as their partner. With an extensive catalog of materials, including trial transcripts and government reports, the Pan Am 103/Lockerbie Air Disaster Archives has become a primary source for research about terrorism. Even though Galvin has now hired an assistant archivist for the Pan Am 103 collection, he still retains the title of Pan Am 103 Archivist because of how strongly he feels about the collection and the families. He has become respected within the profession for his knowledge of collections of this type—after the Virginia Tech shooting tragedy a few years ago, Galvin provided advice and support to the institution on how to preserve both the memories of those lost and critical incident information. In large part because of Galvin’s work and the relationships he has built with the Pan Am 103 families, the Victims of Pan Am Flight 103 (VPAF 103) families’ advocacy group holds its annual meeting on the SU campus. Galvin was a 2008 recipient of the group’s “Keeping the Spirit Alive” award, and has recently been elected to the VPAF 103 advisory board. That is one of the many reasons that Galvin has been chosen to receive a Chancellor’s Citation this year. In addition, Galvin is teacher who reaches out across campus to explain the importance of preserving SU’s institutional history. He gives talks to student classes and to alumni groups. As a result, a growing number of departments and campus organizations contribute materials to the archives regularly, and students understand and increasingly access the resources available to them. Galvin has been a member of the University’s Remembrance Scholar Selection Committee, and works closely with the Remembrance Scholars, preparing them for their roles as campus and community ambassadors. Galvin is a member of the Academy of Certified Archivists. In 2009, he was named a fellow of the Society of American Archivists in recognition of his outstanding contributions to the archives profession. He received an M.A. from Northeastern University in 1980 in historical agencies and administration, where he was the first graduate in the program. He has published several papers, including “Archives of Memory: Pan Am Flight 103” in the Spring 2011 issue of New York Archives Magazine. His presentations include “Darkness into Light: 20 Years of the Pan Am 103 Archives,” which was presented to the Society of American Archivists and the American Library Association in 2009. Spencer is a professor of chemistry and a Laura J. and L. Douglas Meredith Professor of Teaching Excellence in The College of Arts and Sciences, where he is also associate dean of science, mathematics and research. His research interests involve the exploration and application of new compounds to a variety of technological problems, and the creation of materials that have unique capabilities. These materials are critical candidates for use in next-generation photocells and as solid state sensors and detectors of particular interest to forensic and national security applications. His work in cluster photochemistry has also helped scientists to understand the forces holding molecular cluster molecules together. He was awarded the “Distinguished Achievements in Boron Science” award in recognition of his seminal research work in main group chemistry. He is also a member of the New York Academy of Science and the American Academy of Forensic Science. Colleagues describe Spencer as a “passionate, dedicated and gifted teacher,” and his classes are among the most popular at SU. He conceived and created the concept of Integrated Learning Programs in The College of Arts and Sciences, integrating traditional undergraduate majors with those focused in applied areas. He also created the SU Project Advance Forensics Program, which has become the single largest course that SUPA offers, with more than 2,200 students and nearly 200 teachers involved annually. He has also written the definitive textbook and lab manual in introductory forensic science (due out this fall). In his vital outreach to younger students, he has lectured to more than 20,000 high school students in the past decade in more than 200 different high schools about the excitement of scientific creativity and discovery. Spencer has worked with the “Pulse of the Planet” radio program to help excite children about science. The program broadcasts nationally, including on NPR and other stations, to more than 1 million listeners weekly. 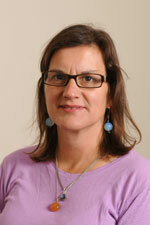 Besides the Meredith Professorship, Spencer has also won the Excellence in Teaching Award from SU’s University College. 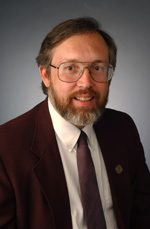 Spencer founded and developed the University’s Forensic and National Security Sciences Institute (FNSSI), joining the issues of forensic science with national security science. The institute, for which Spencer currently serves as executive director, now encompasses 15 core faculty members and faculty fellows, nearly 100 researchers, six corporate partners, four colleges on campus, numerous graduate students and more than two dozen course offerings. He has recently served as the principal investigator, with three other faculty members, on a $912,000 National Institutes of Justice grant in forensic science. Spencer has served in numerous leadership roles at SU, including interim director of the Renée Crown University Honors Program; director of the SU Soling Program; chair of the Faculty Council, Senate Research Committee and A&S Promotion and Tenure Committee. He also serves as liaison for the Goldwater Foundation and the Astronaut Foundation for the University. Since Spencer took over the organization of these scholarships, the University has doubled the rate of students receiving these prestigious and highly competitive awards. He also founded the first National Science Foundation Research Experiences for Undergraduates Award in Chemistry at SU and played an integral role in designing and implementing Mayfest: A Celebration of Study, Creativity and Discovery for its first five years. Spencer’s contributions to the University also extend into the arts at SU. He is the founder and director of the Syracuse University Brass Ensemble, an ensemble within The College of Arts and Sciences, that is a group of 35 accomplished brass and percussion musicians comprised of SU faculty, staff and students; the State University of New York Upstate Medical University faculty and staff; and musicians from Upstate New York communities. The SU Brass performs annually at the SU Commencement, for the annual “Holidays at Hendricks” concert that is broadcast on WCNY, and has twice placed first nationally in the North American Brass Band Association’s Festival. A professor of managerial statistics in the Whitman School of Management since 1998, Velu’s research focuses on multivariate analysis and data mining, among others. He has published in numerous premier journals in statistics, and his work in data mining is driven by extensive contacts with leading high-tech Internet firms, including Yahoo!, Microsoft and IBM. His intellectual contributions have resulted in several patents and his articles in data mining are presented at the most prestigious global technology conferences. With Microsoft, Velu worked with data scientists and engineers to develop Prodcast, a price prediction engine for high-end products sold on the Internet. At Yahoo!, he was the lead advertising marketplace architect for the Sponsored Search division and developed a signature click-bid landscape based on empirical analysis of search/impression/click bid data. 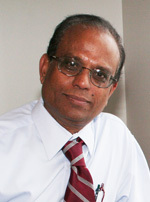 “Raja’s intellectual contributions exemplify the ‘innovative curiosity and experimentation that contribute to new understandings of our world and creative responses to its problems,’” says Michel Benaroch, associate dean for research in the Whitman School of Management, who nominated Velu for the award. Velu has led and worked on seven sponsored JPMorgan Chase research projects, bringing a total of $1.8 million to campus and producing results that are poised to appear in the most prestigious academic publications in finance and data mining. He was chosen in 2011 as an inaugural JPMorgan Chase Faculty Fellow, serving as a liaison and facilitator between JPMorgan Chase and SU and helping to foster deeper understanding between the two institutions and facilitating collaborative research. In this capacity, he helped JPMC managers develop awareness of Syracuse University’s faculty excellence in several areas of expertise and facilitated faculty connections with JPMC teams. “Raja’s extensive work with industry leaders, and particularly his relationship with JPMorgan Chase, is an amazing example of how excellence in intellectual endeavors combines with excellence in service to Syracuse University and its strategic partners,” says Benaroch. Velu has served as department chair in Whitman and on numerous college committees, including dean and associate deans’ evaluation committees. He is also a well-known leader in his professional communities and has held a visiting appointment in the statistics department at Stanford University since 2005. As the director of community initiatives in the visual arts in the School of Education at Syracuse University, Wilson works in the Near West Side, where she promotes the coproduction of culture in collaboration with the city schools, the neighborhood and SU. Wilson, who is also an associate professor of art, design and transmedia in the College of Visual and Performing Arts, is the founder of 601 Tully, a center for engaged artistic practice that houses an international art gallery, incubates high school entrepreneurship and offers neighborhood barista certification classes in its Recess Cafe West. 601 Tully is a living sculpture where artists, community members and scholars engage in the coproduction of culture. The building at 601 Tully was an abandoned residence that had become a neighborhood drug zone. Students in Wilson’s “Social Sculpture: 601 Tully Design/Build” class (students from the School of Architecture, College of Visual and Performing Arts, School of Education, Creative Writing Program, SUNY College of Environmental Science and Forestry and Fowler High School) were responsible for re-zoning, designing, building and sustaining the program. 601 Tully opened to the public in June 2011. 601 Tully is also made possible by the support of the Syracuse University School of Education, The Kauffman Foundation, The Near West Side Initiative, Imagining America, Home HeadQuarters Inc., Say Yes to Education and National Grid. Wilson devised her “Social Sculpture” interdisciplinary curriculum in 2007. She conceptualized and directed the construction of the Mobile Literacy Arts Bus (MLAB), a 1984 Winnebago that was converted into a mobile classroom by a team of art, architecture and design students. MLAB was born as a physical space for use as a mobile classroom, digital photo lab, gallery space, radio, publishing house and community center for students in the Syracuse City School District. The bus also offered creative art, photography and writing programming during afterschool programs for elementary students through Say Yes to Education, and a conversation and creativity space for young women in high school through an MLAB-developed program, Girl Talk. Wilson also maintains an art studio and art practice in New York City. She has had exhibitions or completed public commissions for New Museum of Contemporary Art, New York City; KK Art Projects, New Orleans; Dorsky Gallery, NYC; and Shroeder Romero Gallery, Exit Art, Cheryl Pelavin Fine Arts and Sculpture Center, NYC; Hallwalls Contemporary Arts Center, Buffalo; SPACES in Cleveland; and SCOPE Miami/Art Basel in Miami. Wilson received a bachelor’s degree from Wesleyan University, a master’s degree in pedagogical studies from Columbia University, and an M.F.A. from the University of Cincinnati.